It’s no revelation that in today’s world many people suffer from some form of spiritual crisis. But, fortunately, there is hope. 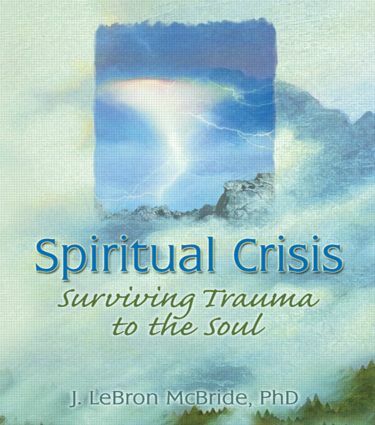 In Spiritual Crisis: Surviving Trauma to the Soul, you’ll discover how you can reverse the impact of spiritual crisis and apply healing balm to the traumatized soul. A comprehensive, real-life approach to spiritual care, it gives you the understanding necessary to put a lid on the daily chaos that seeks to destroy those whose lives have been shattered by tragedy, terror, and disillusionment. Written from the perspective of a compassionate professional who has navigated the dark and turbulent waters of his own spiritual crises, Spiritual Crisis represents a loving cross-section of aid from the fields of pastoral theology, psychology, and health care. Christians and non-Christians alike will benefit from its frank approach to aiding troubled souls through the tough times of belief transition, loss of faith, and potentially damaging extremes in living and thinking. Oftentimes, it’s hard to know what will make a loved one survive or succumb to the impact of seemingly insurmountable personal emergencies. However, this book is a “call to care” that will enable you to help others turn back the tide of debilitating hardship in their lives and restore the tempering unity of mind and body. Whether you’re a beginning pastoral counselor, a marriage and family therapist, or friend of a troubled loved one, Spiritual Crisis will show you and those you work with how to turn crisis into care. Preface. List of Figures. List of Tables. Acknowledgments. Introduction. The Crisis of Trauma. The Crisis of Relationship and Family Problems. The Crisis of Disillusionment with the Church. The Crisis of Belief Transitions. The Crisis of Denominational Identity. The Crisis of Extremes. The Crisis of Loss. The Crisis of Physical Illness. The Crisis of Religious Burnout. The Crisis of Psychological Disturbance. The Crisis of Personal Identity. The Crisis of Ethics. The Crisis of Working with People in Crisis. Epilogue. Notes. Index.